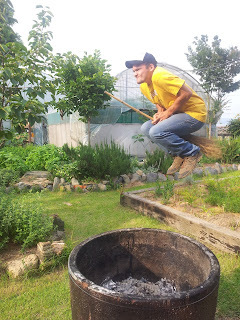 One step at a time, Juan works closer to his goal of self-sufficiency and eventually surplus. 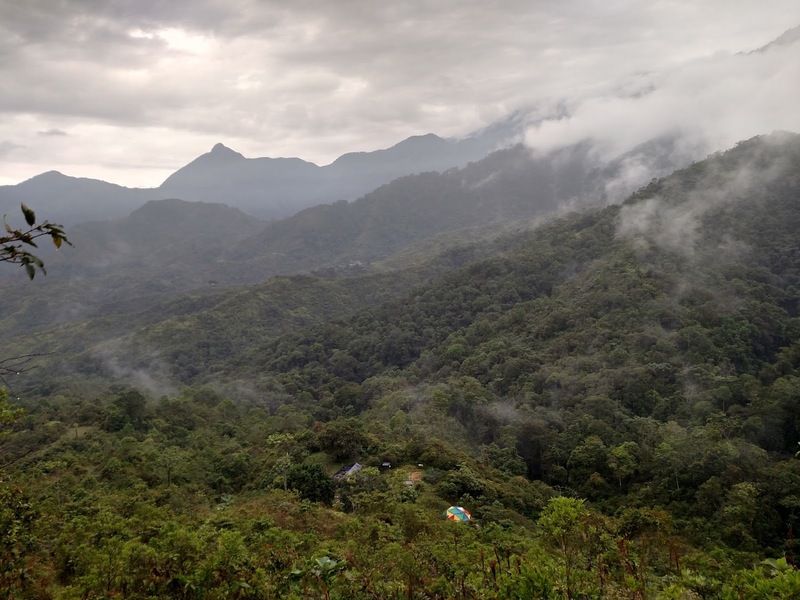 Yuca, fruit trees, staples like maize and Amazonian wheat, guadua for building and timber for cooking—even cotton for clothes—are all growing at Juan's remote mountain farm. When I asked where he learned his growing methods, his answer was quick: the forest. "El suelo tiene toda la informacion." 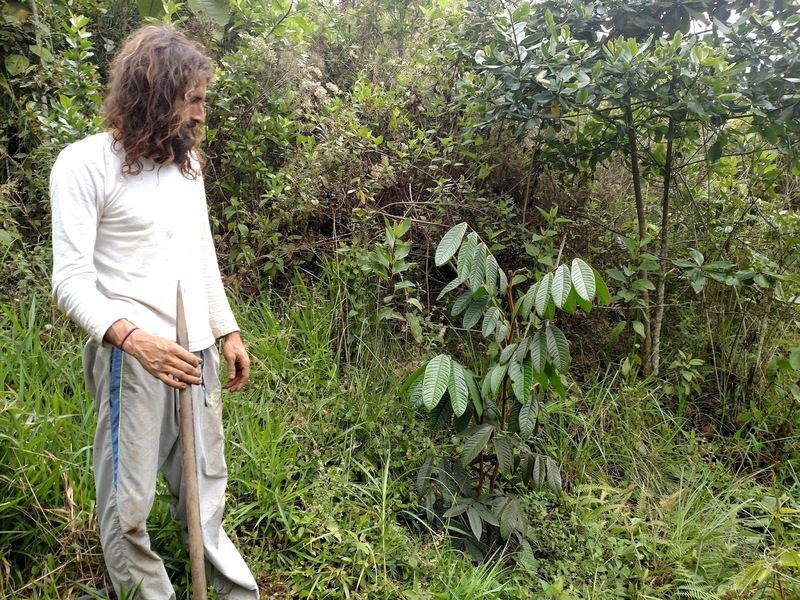 With a mix of muscle and patience Juan replicates the forest ecosystem in his production system, an eventual food forest or bosque de fruta. 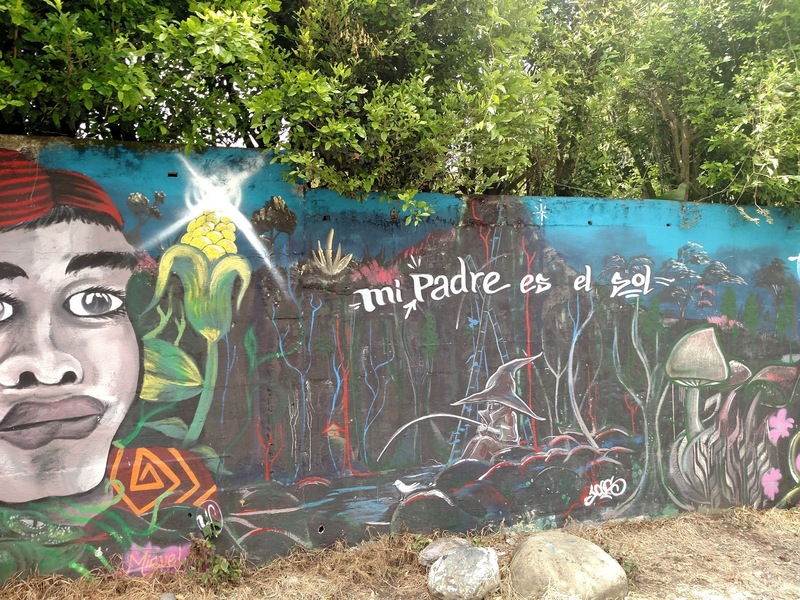 And Juan must know a thing or two about ecosystems with one forming in his hair. View of farm from above. On the whiteboard of the main tent, under the tierra section of the elemental to-do list, says traer la vida del bosque. 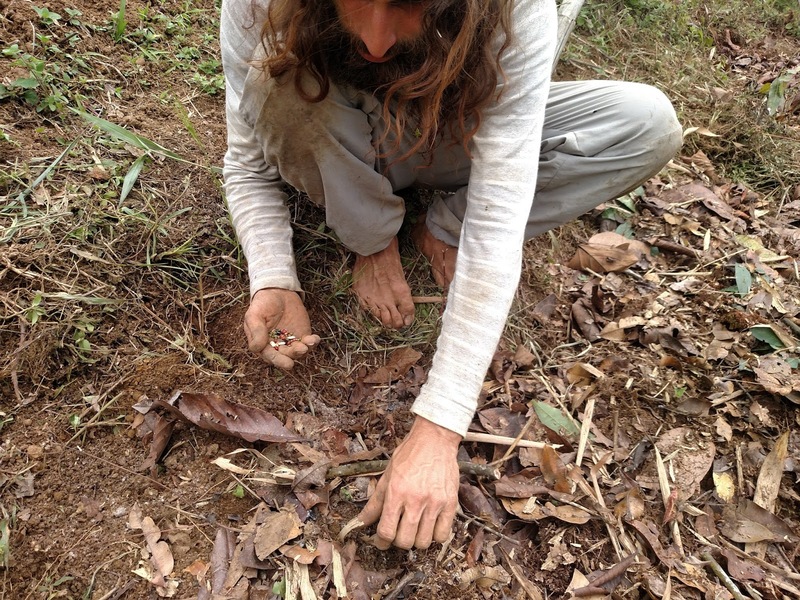 Tierra tasks relate to building soil and growing food, and "bringing the life of the forest" into the garden achieves both. So we headed up the mountain with sacks in hand. 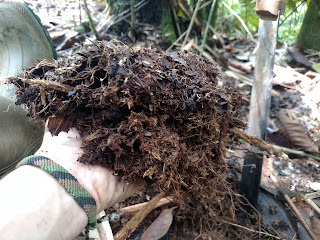 Bouncing along on the spongy forest floor we filled our sacks with vida del bosque: organic matter like leaves, roots, seeds and caca de vaca, and organisms like worms, mycelium mats (fungus) and bacteria. 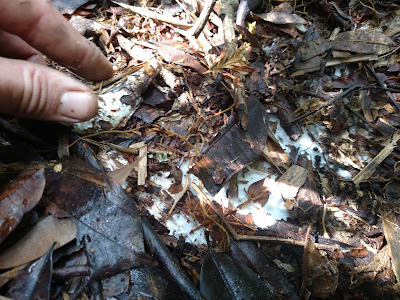 Mycelium: a network of nutrient-exchange between life and death. Every disturbance is an opportunity for new life. Before adding la vida del bosque, Juan must cope with compacted clay soil and invasive grasses—both consequences of the farm's prior use as pasture for cattle. After WWOOFing on nearly 25 farms it seems each has a unique process for bed preparation, depending on soil conditions and available tools. Aerate - Juan uses a homemade broadfork with tree-trunk handles and rebar spikes to loosen the soil (to invite oxygen, water and root growth) without turning it over (to preserve structure and microbiology). Four or five blasts from overhead drives the 14" (35cm) broadfork blades deep enough to pry up a patch of soil. No gym membership needed. Weed - All competing plants must be pulled, roots and all, to favor crops of choice. Each bed is a battle in the "war against the grass" that Juan forever wages. Amend - Now is the time to add fertilizer or soil amendments. Juan adds ash from the oven for potassium and higher pH. 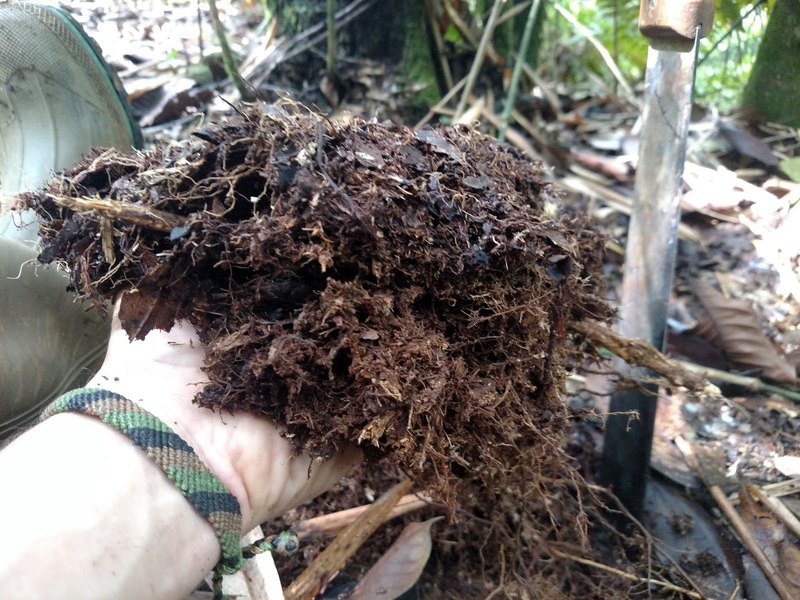 Mulch - Apply a layer of Vida del Bosque until soil is covered. Aside from introducing la vida and its nutrient cycles, mulch protects soil from moisture loss, weed growth, and erosion from wind and rain. Plant - During my stay (Feb. 27 to March 12, 2017) we direct seeded tomatoes, guandul, a variety of beans, pepper and amazonian wheat, and transplanted gaumo seedlings. 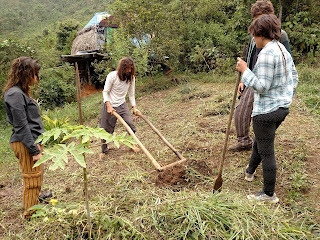 Volunteers admire Juan's broadfork skills. 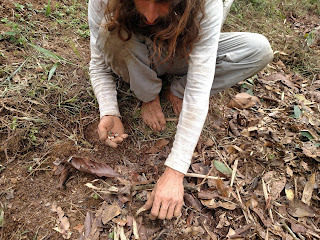 Juan planting beans and guandul. 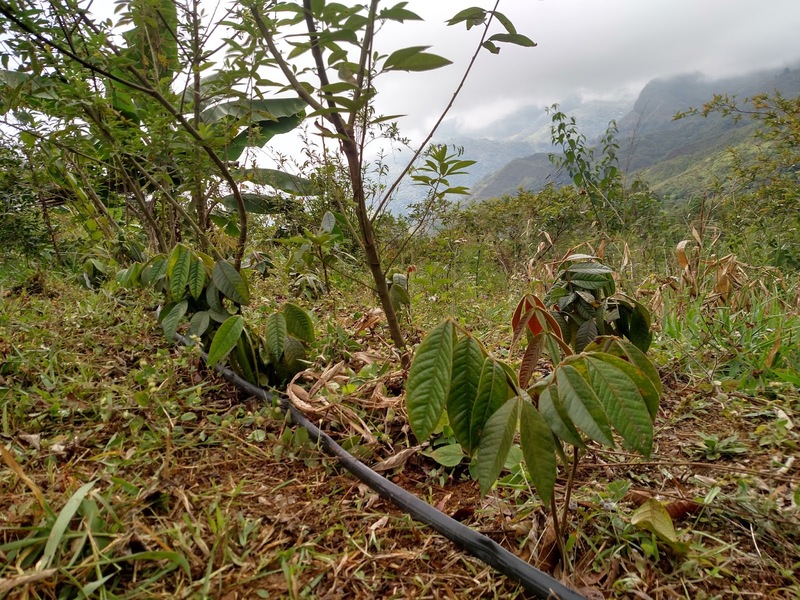 Companion planting is another lesson Juan learned from the forest, where multiple species grow together, each contributing to the greater ecosystem. 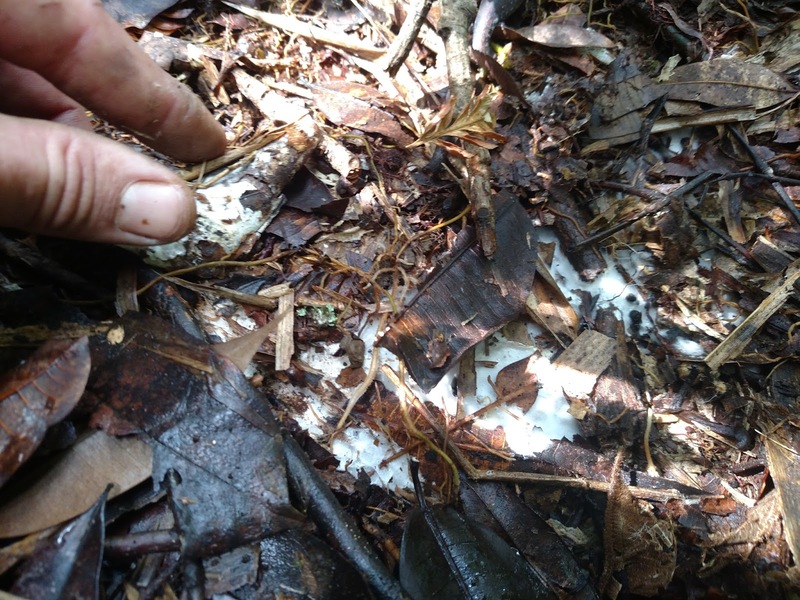 For instance, legumes and their rhizobia (bacteria in their roots) build nitrogen in the soil. 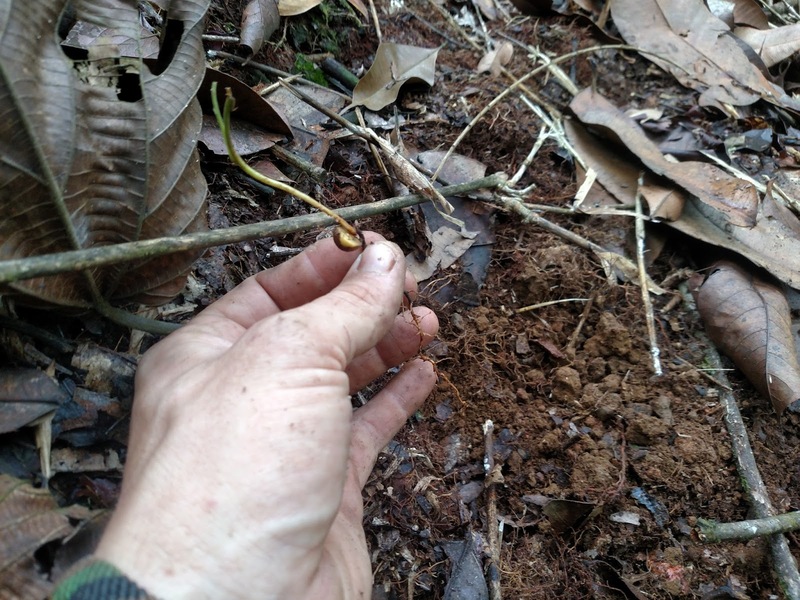 Faster-growing plants, such as guandul (pictured below) die young and become mulch for slower-growing plants, such as the avacado, mango and citrus trees that'll eventually form Juan's bosque de fruta. 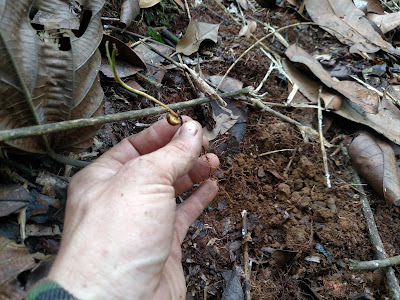 Two legumes: Guamo seedling growing under Guandul. 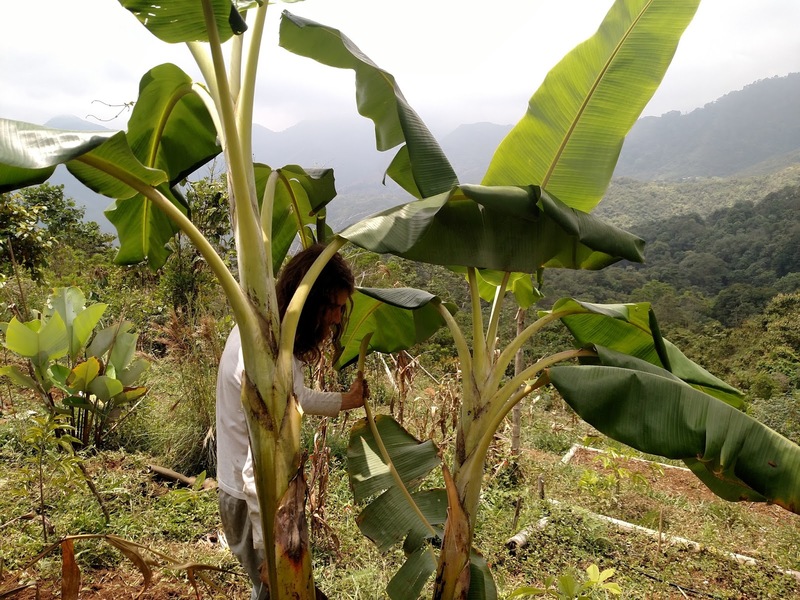 Juan cutting plaintain for mulch (i.e. "chop and drop"). Murals in the town below, Voragine. As Juan likes to say after a day of good food, good company and hard work: Un dia ganado, one day gained. [*] Follow Un Pasito a la Vez on facebook and official website.